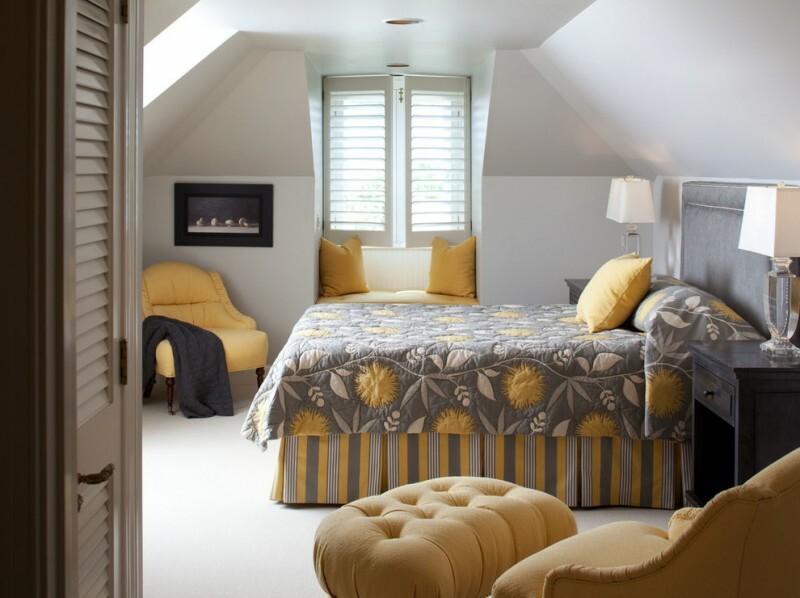 Yellow mustard bedroom ideas are just a few of wonderful ways to get fun and playful nuance in your most private room. Yellow mustard itself is a dark and dull yellow color scheme that represents something related to culinary mustard. Most people say this color is really similar to Flax. And, baby mustard (darker yellow mustard) becomes the most favorite nowadays. 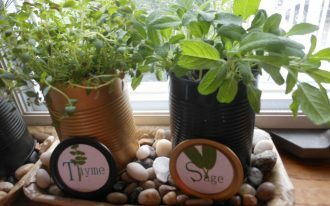 It’s often used for any rooms, including the most private room like a bedroom. 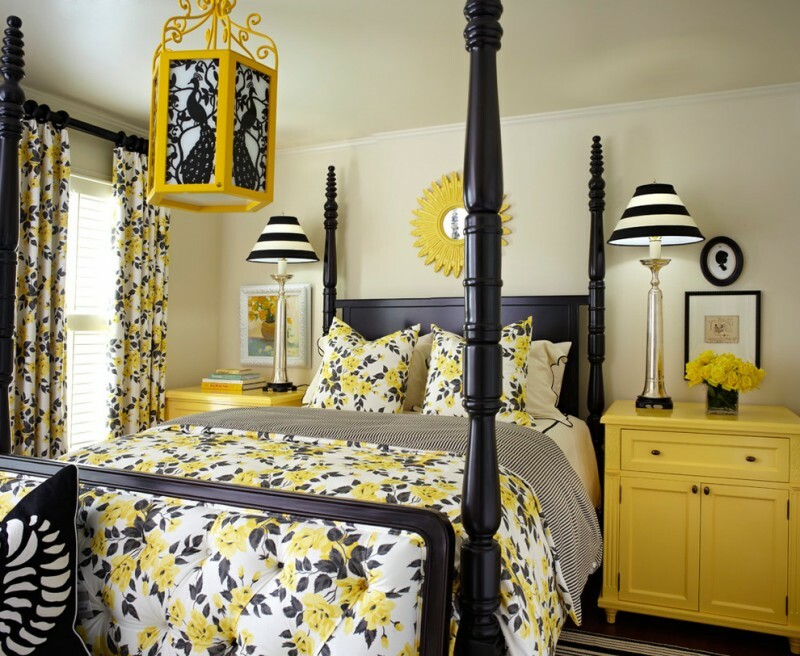 The followings are huge collections of wonderful yellow mustard bedroom ideas that probably inspire you when having a bedroom remodel project. Yellow mustard and grey are always wonderful. 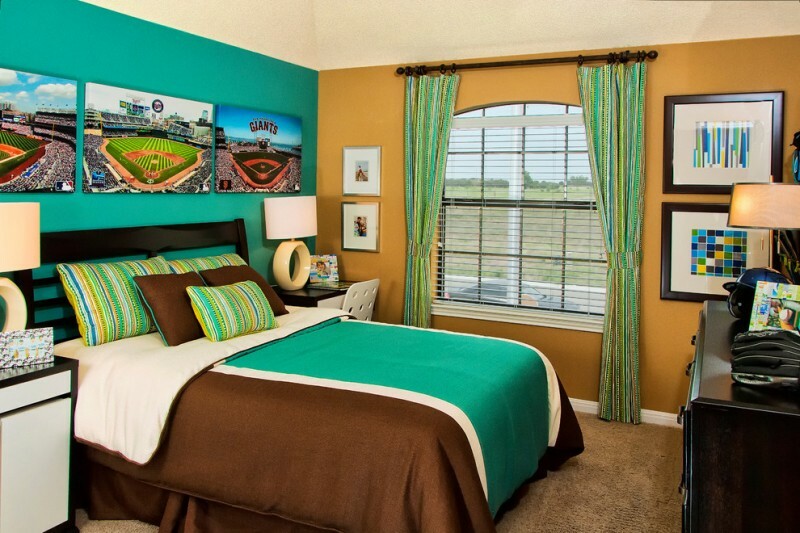 Such color choice really matches for a beach-style bedroom. Both colors are obviously contrasting. 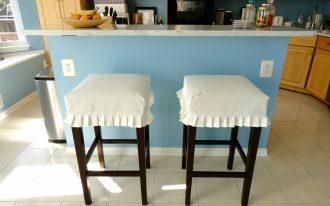 Add bright color scheme like white to create something pure and clean. 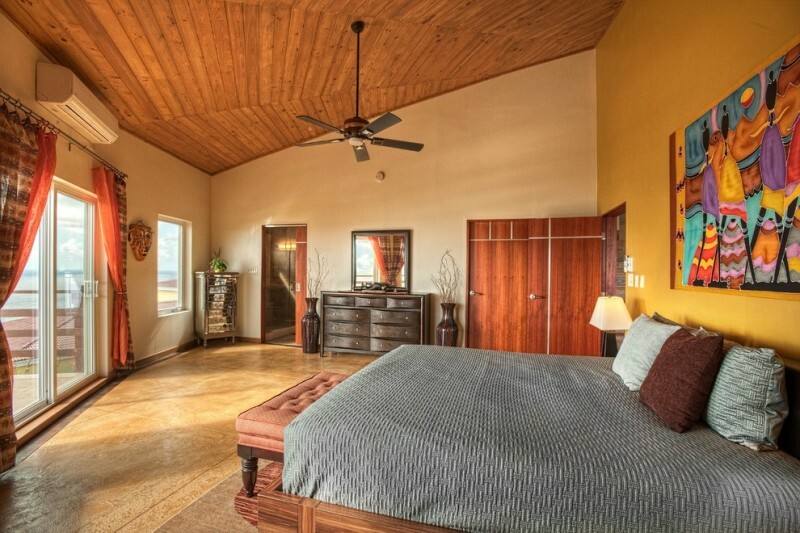 Wood floors here also bring a huge natural warmth in this bedroom. Another idea of grey and yellow mustard. This is another great and powerful color combination. The bedroom turns into the most trendy one and likely to apply for most homes recently. 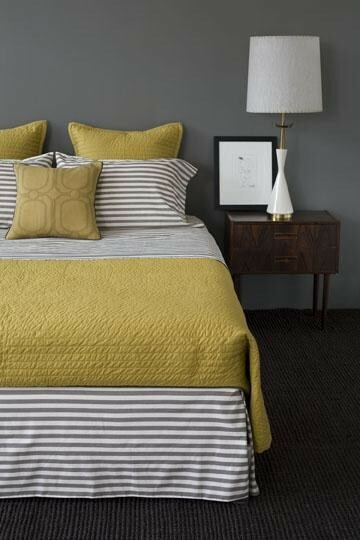 Apply this color combination for your bed area only like grey stripped comforter and yellow mustard quilt. 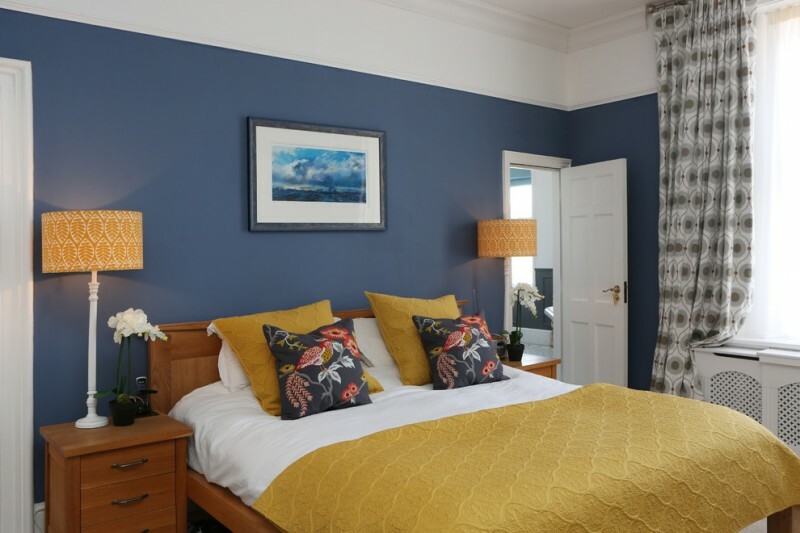 This bedroom has a glance of coastal theme with navy blue, but we wanna try to add another trendy color: yellow mustard. 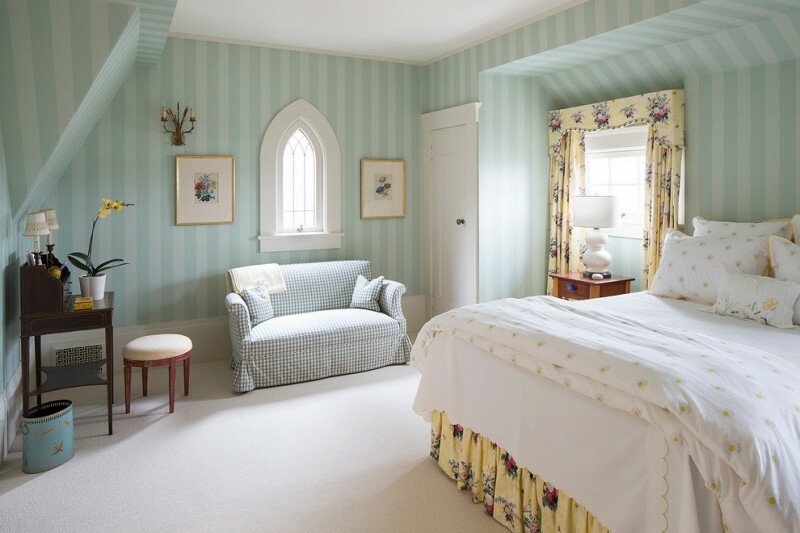 The room is also highlighted by floor-to-ceiling drapery for giving a dramatic window treatment. Wood element on bed frame makes this room naturally warm-feel. 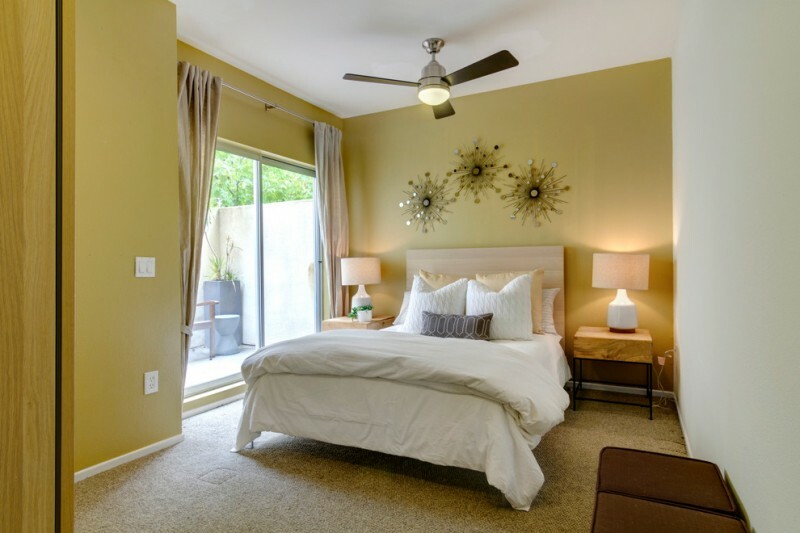 Get a trendy and contemporary bedroom by choosing mustard and beige as the interior colors. Use these colors for walls and pair them with grey stripes bedding linen. Dark neutrals like black and dark-tone wood interior items would be a perfect match for this room. Mustard and gray are able to create a clean and bright look. 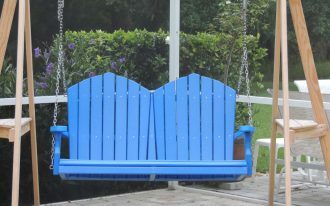 It’s optional if you want to combine it with any color tones, including dark and wood colors. Bubbles with lighting inside. These artificial bubbles are made of transparent glass linked each other, creating a creative wall arts. Mustard walls become much more special with this. Large dark grey leather headboard offers a beautiful contrast to this bedroom. It’s a great idea to apply mustard ceramic wall system with modern patterns. Contrast it with clean white headboard as the accent color, a similar color to unique bedside table. Baby mustard looks so gorgeous for bedding treatment and pillows. 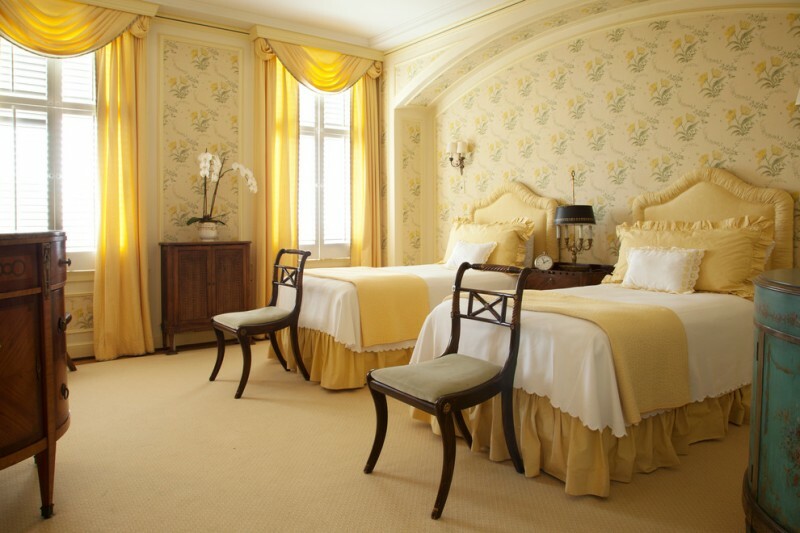 Yellow mustard wallpaper with classic motifs has changed the look. We’ve seen a classic style room where we can combine another gold color that can light the space up. Dark-toned wood floors become an exotic base for these glowing gold and mustard interior. Create clean line effect just by applying mustard and white. Mustard color here is able to give warmth and softness, enhancing a relaxing nuance. Combine those colors with decorative metal artworks on walls to add beauty. A great kids’ bedroom! It’s unique and so inviting. 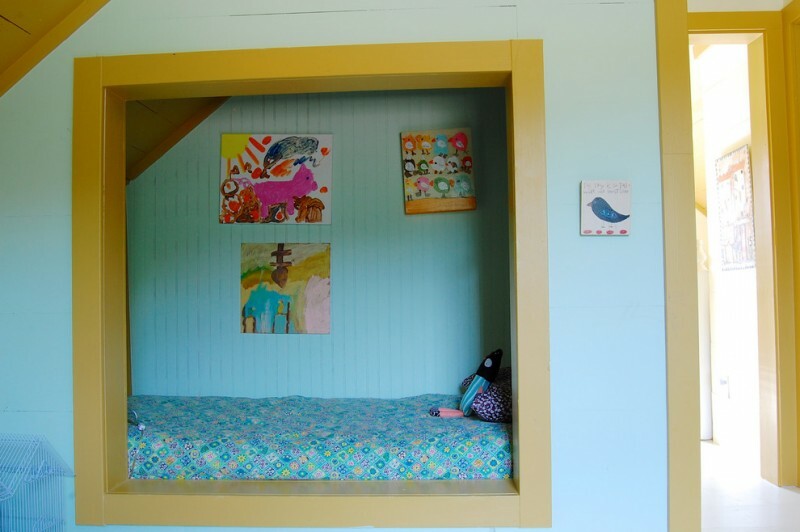 Yellow mustard has framed a recessed bedframe with bright blue walls. 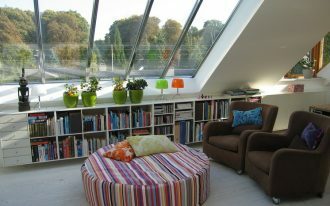 As if it gives the kids a fun isolated space for relaxing. 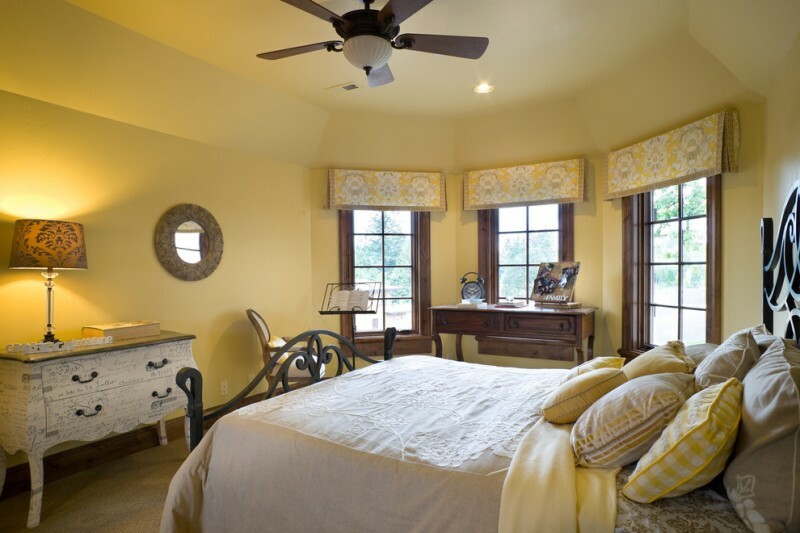 Make your master bedroom fresher just by giving little mustard for a stunning accent color. 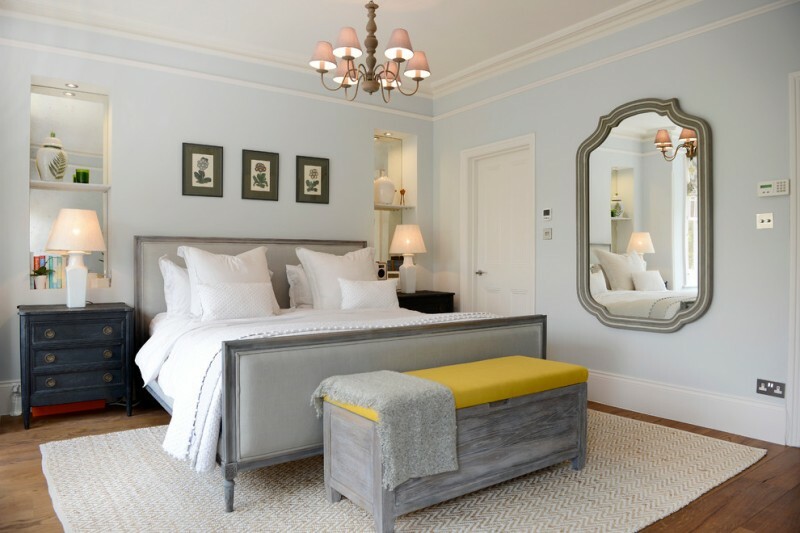 The bed seat with mustard top and grey wood frame has placed against the pale blue walls, pop and soft color as one. Cover your bed with such a stunning mustard bed linen. Contrast it with something bright and attractive like these pop-colored pillows. 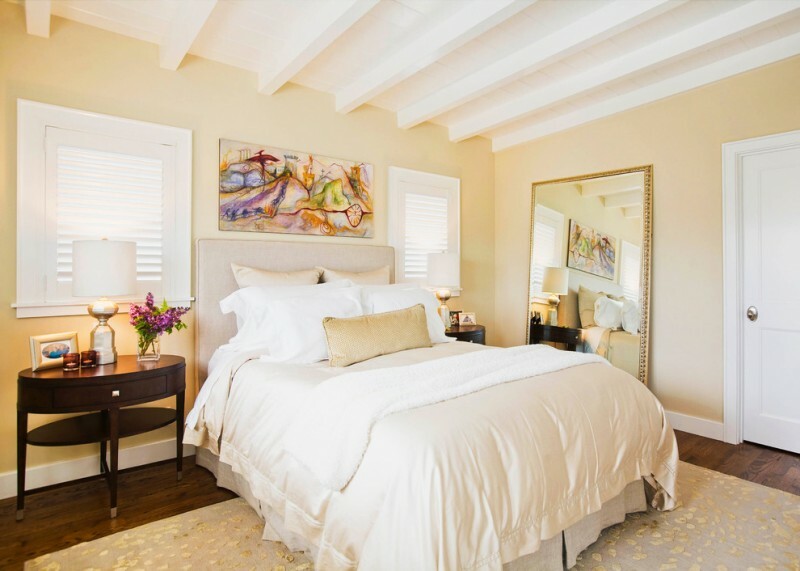 Grey-painted and low-slanted ceilings sound great to use over your bed. A transitional bedroom with eye-catching mustard walls garnished with well-ordered wall arts and clean white draperies. A classic bed with canopy adds exotic value in this private room. Rich mustard combined with deep blue. Their opposite color tones look so great when being paired with natural wood color and clean white. Each tone has their own power to make the room more vivid and attractive. Classic yet elegant. 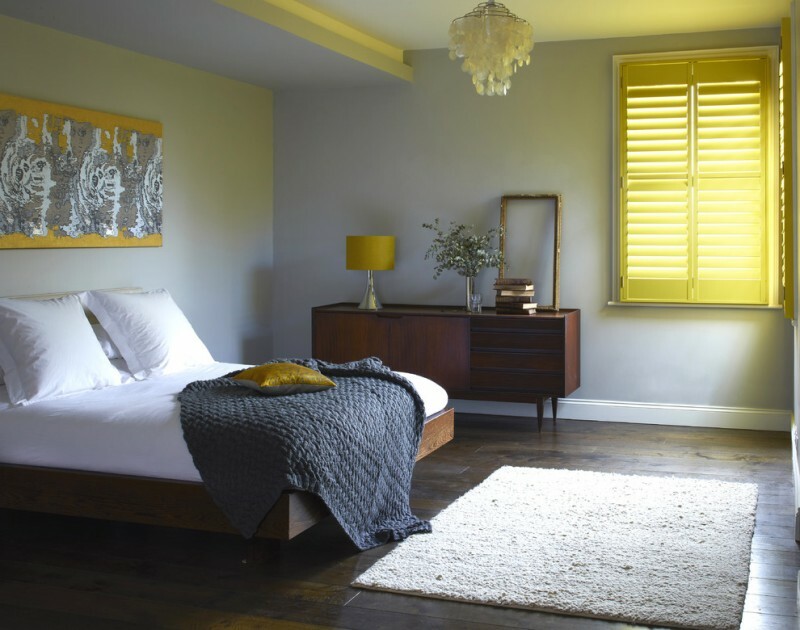 With dominant mustard, this bedroom looks so soft but bright like sunshine. Fill it with bronze-toned furniture as the accent and medium-toned wood floors add the warmth feel. Random palette decorations on walls. 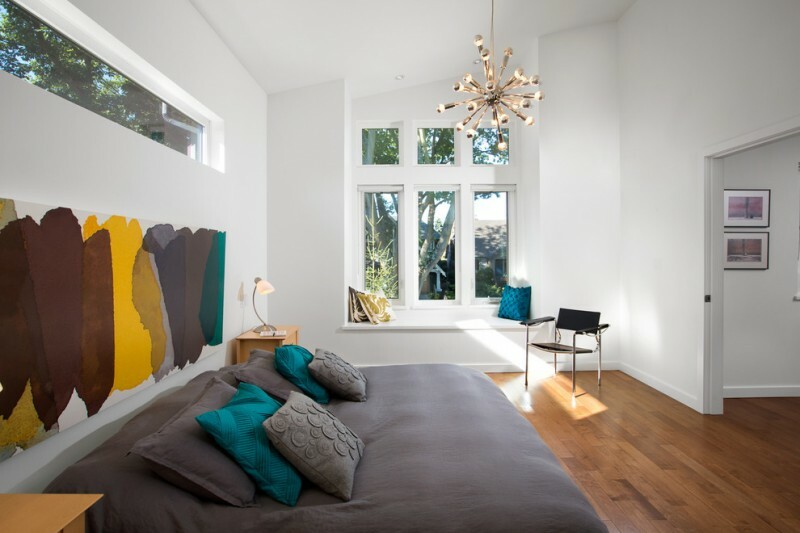 Simple yet creative way to colorize your contemporary bedroom. 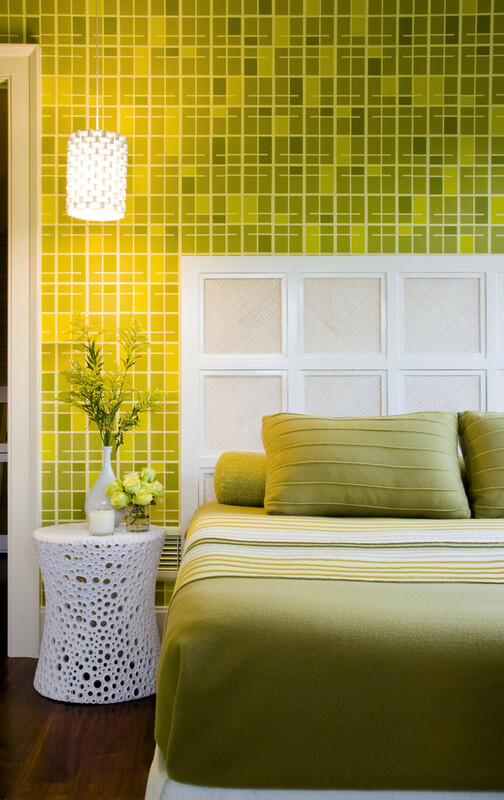 Add bright and deep colors like mustard and deep green among those palettes. It must be so attractive. Mustard yellow is always stunning. The color is used for several interior items like window shutter, table lamp’s shading, and throw pillow. 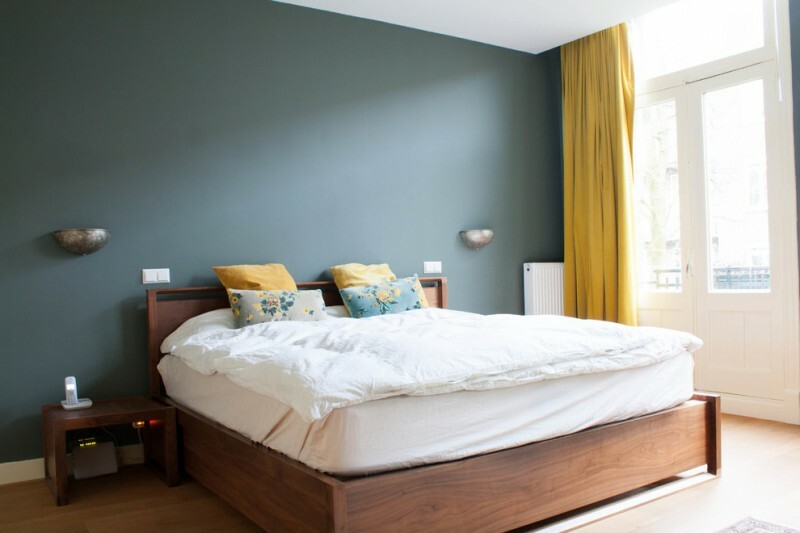 Take a look at the walls behind the bed, we’ll found mustard application in gradation way. Unique! How elegant this master bedroom is. The space is completed with a couple of classic chairs and a mustard loveseat, a perfect spot for having fun chats with the loved one. A guest bedroom idea with soft mustard and white mixture. 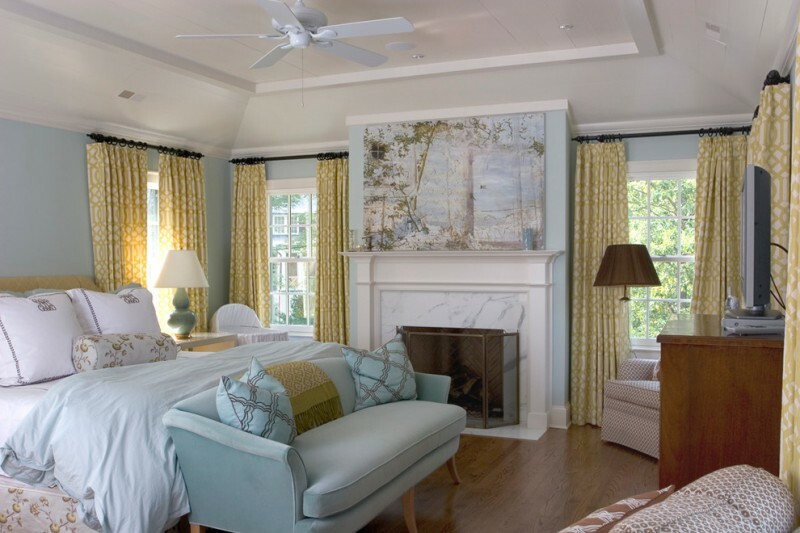 Both color schemes are dominating the room, giving soft, clean, and airy nuance. Walls and carpet have quickly grabbed our interest. Why? Each emphasizes their own attractiveness such as the texture and color. Here, the designer wants to expose these values. A timeless bedroom idea dominated by white and mustard. These colors are well-recommended for a bright and fresh interior idea. 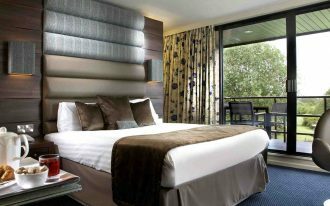 You may combine them with any color tones, including pop of colors like deep green curtain over the headboard and pink for comforter and bedside tables; traditional yet trendy on color choices. Sound great, right? A master bedroom with midcentury modern concept. Here, we’ll discover mustard and grey that fill the room. Most designers say these colors are a perfect match. Quite agree! 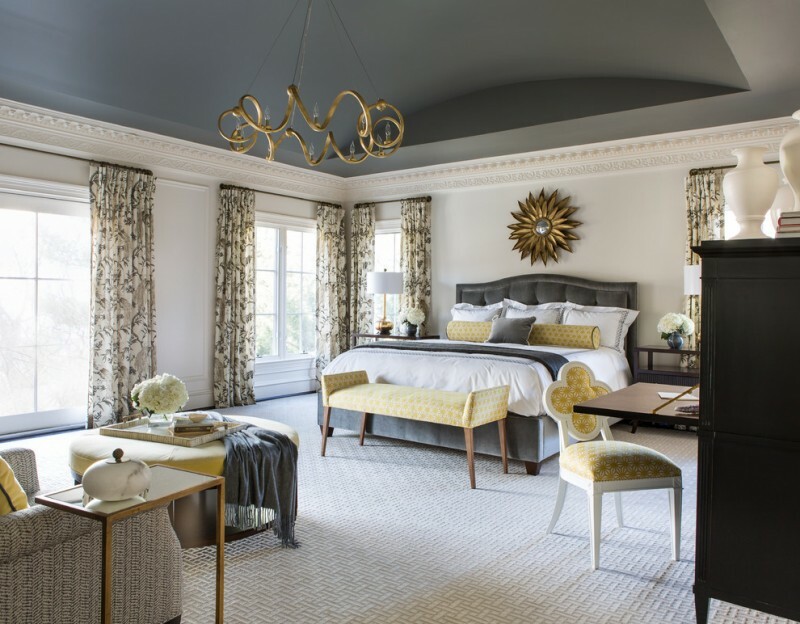 An inspiring classic guest room with dark-toned canopy. It’s always be a great idea to combine mustard and dark tone like shiny black. It’s a beautiful contrast. Light mustard is also associated with bright sunshine, possibly connected to happiest hues. This color is also pure, matching for teens room, especially girls. Pair it with other girls’ favorite hues like pink and blue. Mustard is the color that reflects sun and warm light. They seem to shine and glow from inside. In this room, we have different shades of mustard, starting from the lightest to boldest, displaying the richness of mustard. 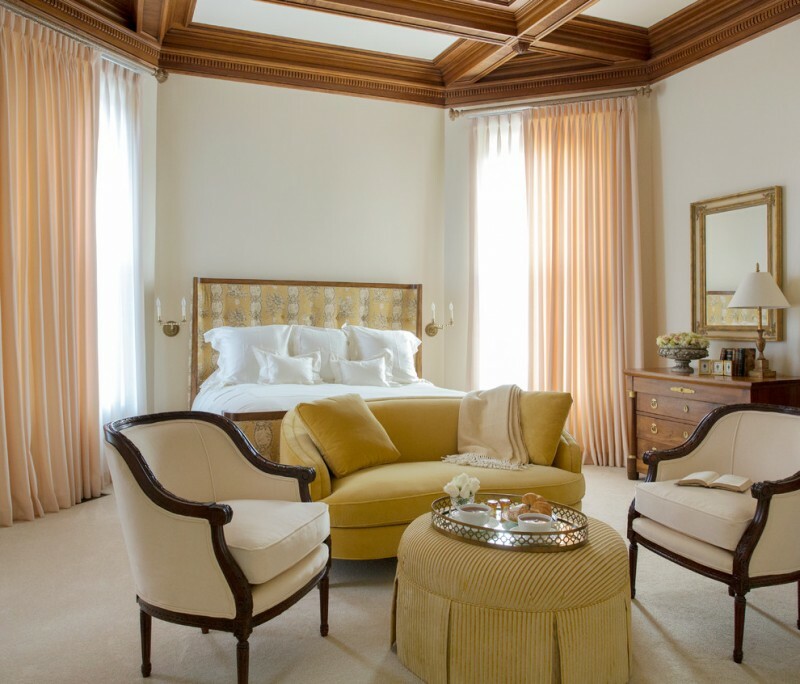 Elegant and classic master bedroom design – exposing ultimate warmth and luxury on its premier properties. The color choice also takes a significant role: showing the best performance for each color tone, especially the mustard that brings soft and warm feel. Pale mustard – creamier and warmer than beige. The color has a distinctive character than yellow. With correct complementary colors, you’ve got ultimate soft and warm just by picking this hue as the primary interior tone. Light mustard makes the room brighter. Wood furniture is truly acceptable for such a pale hue, adding the darker tone among those pale mustard interior and properties. How colorful this boy’s room is! Not only the theme, the color choice is also really smart. Here, the designer mixes and matches more than one bold color in this room. All color tones are bold, and the table lamp has successfully brought warmth and provides additional ambiance. Light mustard combined with dark-finishing bed frame, an instant way to have an accent color to this room. 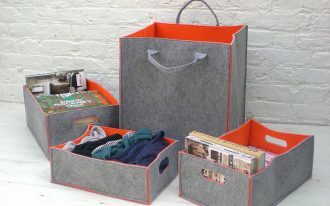 You may try it when planning or having a bedroom remodel project. 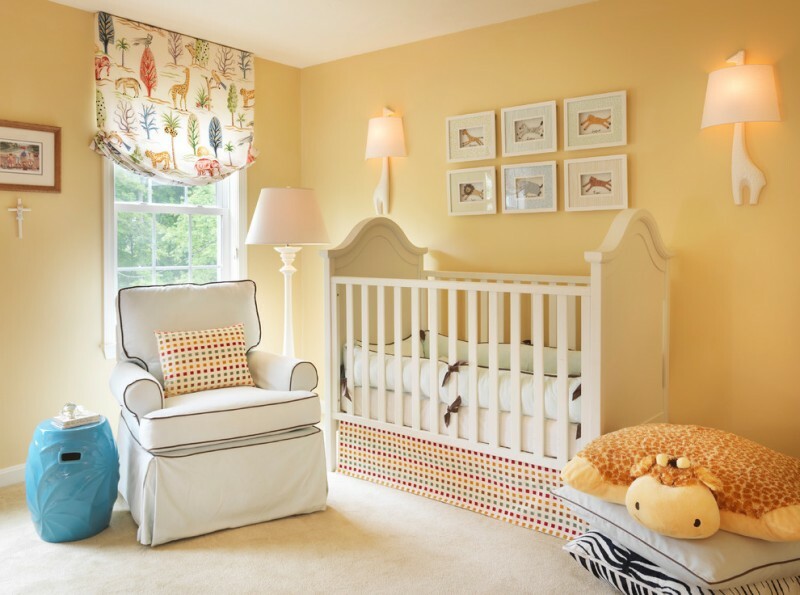 An elegant kid’s bedroom, especially for girl with light mustard and classic carpet. All furniture set is white, contrasting against the walls’ and bedding treatment’s colors. It’s ideal for most girls due to its feminine tones. The designer uses white furniture and gives it a stunning and fresh by involving the bold pop of colors like mustard, turquoise, and fruschia. Sticking paper sunflowers on the sunny mustard walls, for instance, have popped on and been a direct interest in this room. Such a lovely color choice! 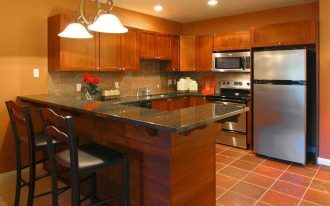 Dark wood beautifully contrasts to soft and neutral colors like silver, white, and brown. 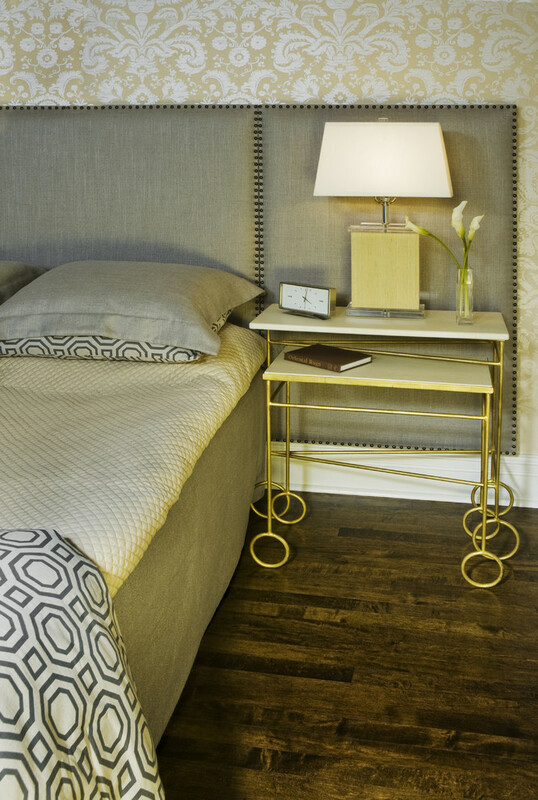 Low and yellow-lighted table lamp obviously assists the mustard walls to keep shining on. Put just a little mustard on such a large master bedroom for an accent color. It’s optional to pasting mustard on properties you love. Working/ studying chair, bed settee, and decorative pillows are commonly great with this soft and warm color. Create the positive energy just by repainting your toddlers room with such colorful schemes. Mustard walls with decorative flip flop pictures have been a unique background for sweet pink bed. Large polka dots curtains add another cheerful look in this room. 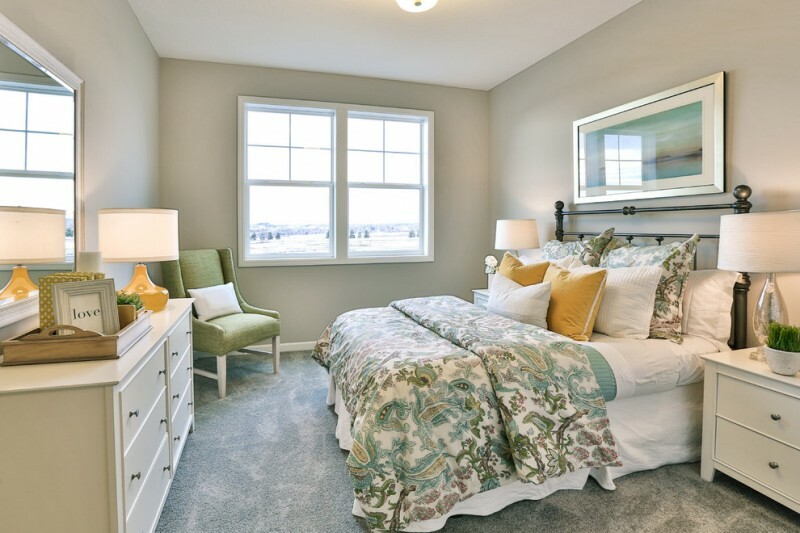 Simple yet cozy – a traditional bedroom with dominant grey accented by little mustard and green colors. A fabulous color choice! 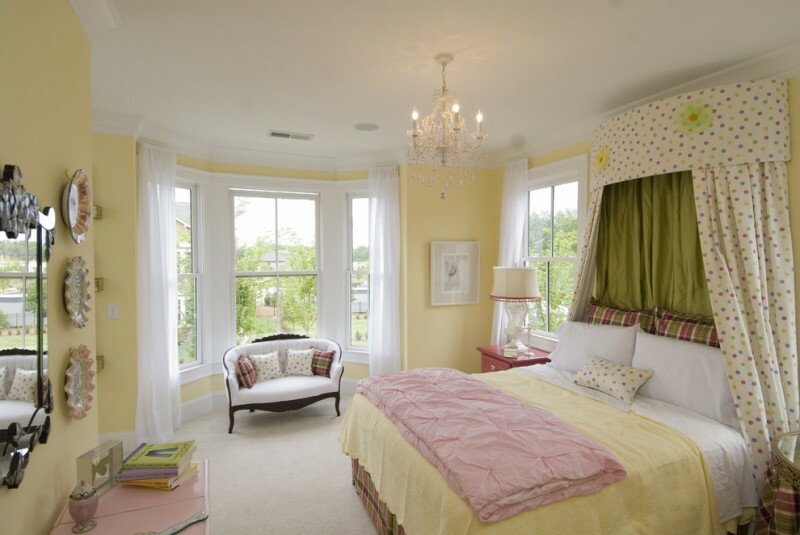 Feel the freshness of spring on your bedroom with such a soft mustard accent color discovered on window curtains. 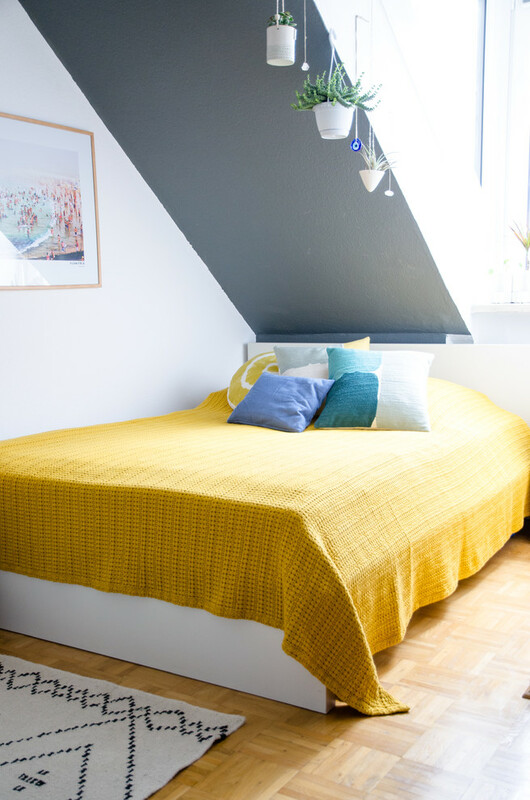 White on bedding treatment and light blue on walls is best match for mustard that looks bright and vivid. Dark wood floors here become a neutral element that seems to reduce the brightness a bit. A lovely mustard walls with bright white picture frames. The main reason why we should choose white as the best match for mustard is both are contrasting but complement each other. The colors also create clean and fresh look. Light mustard dominates this guest bedroom. Various grades of mustard colorize the room and the designer puts a couple of chairs instead of bed bench. Deep blue and yellow mustard are powerful here. These colors reflect neutral-genre kids room with a trendy wool carpet for maximum comfort. Well-recommended for your twins. Mustard gold ‘frame’ made of best fabrics with beautiful flowers. It’s much more unique and aesthetic instead of ordinary window curtains or other kinds of window treatments. Use similar product for the bed slipcovers. Classic on soft mustard. Feature it with some neutral color schemes like grey, glowing silver, and white; you’ll get the best bedroom remodel as what you’re dreaming on. 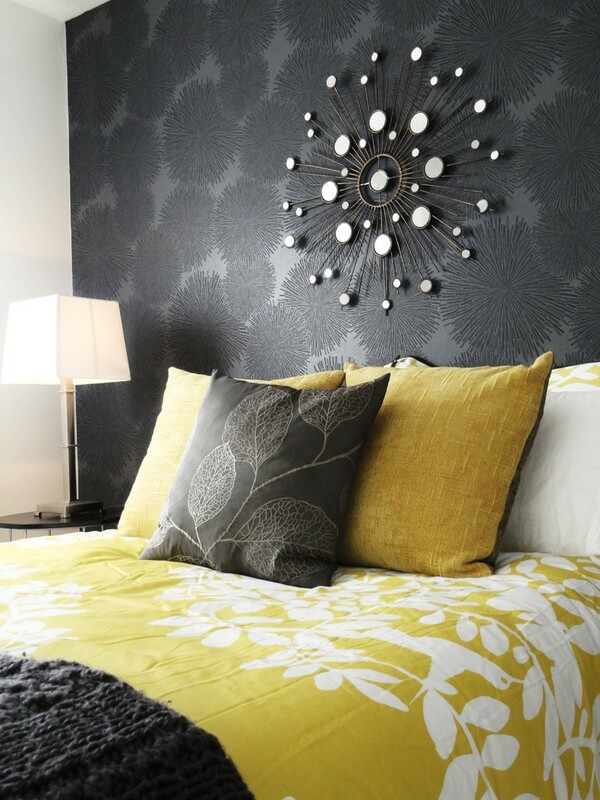 To grab a trendy and modern mustard bedroom, it doesn’t have to take the mustard as the primary hues. We can use it as the secondary one for secondary items, too like the pillowcases, ottoman chairs, lamp’s shades, and roll-up window treatments. 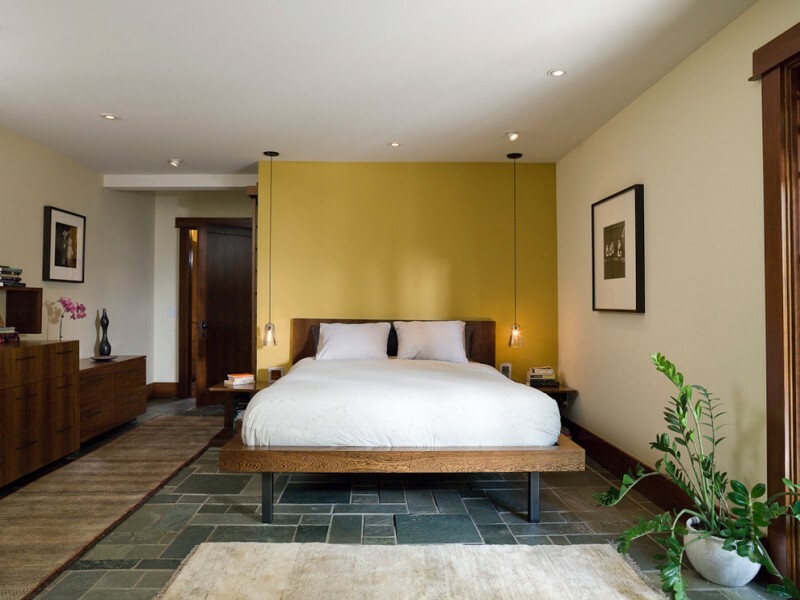 A contemporary master bedroom idea featuring concrete tiles floors and mustard wall as the bed’s background. Overall, this private room is inspired from Japanese interior idea that emphasizes the simplicity and functionality. It’s designed for the girls where we’ve found funky mustard accented by plum purple. The whole room is full of freshness and will last longer for years. Play deep-neutral color and combine it with deep-pop colors like mustard. This dark wall with lighter grey motifs becomes the best ‘canvas’ for the metal wall art and bed. They contrast yet exotic. Love this mustard and turquoise colors on walls. They’re so striking and ideal to pair with any other striking and neutral-deep colors as what has been applied on window curtains and bedding treatments. A timeless bedroom for guests. 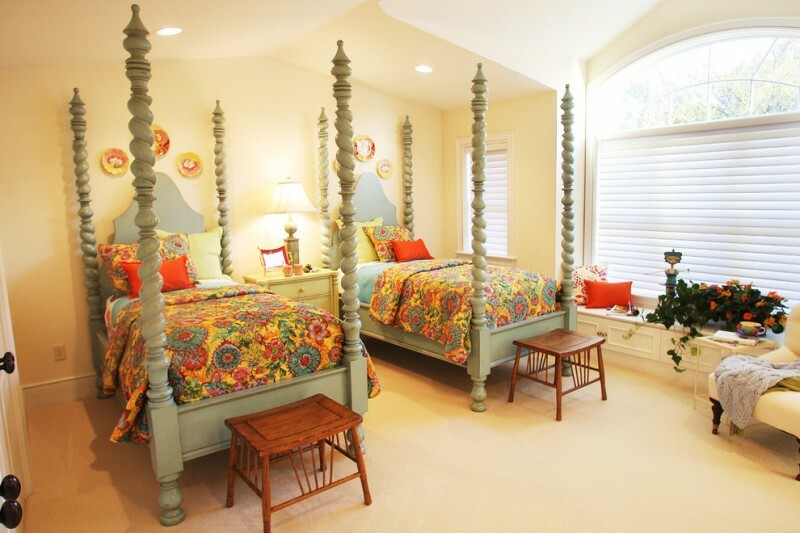 The bed frames are so unique, but the mustard walls are much attractive, giving soft and calm atmosphere. Add something striking like these bed comforters and pillows. Create an elegant bedroom for adults by taking the carpet out and replacing it with glossy wood floors. Black finished furniture and black stained window treatment seem to be the best pair for mustard walls. 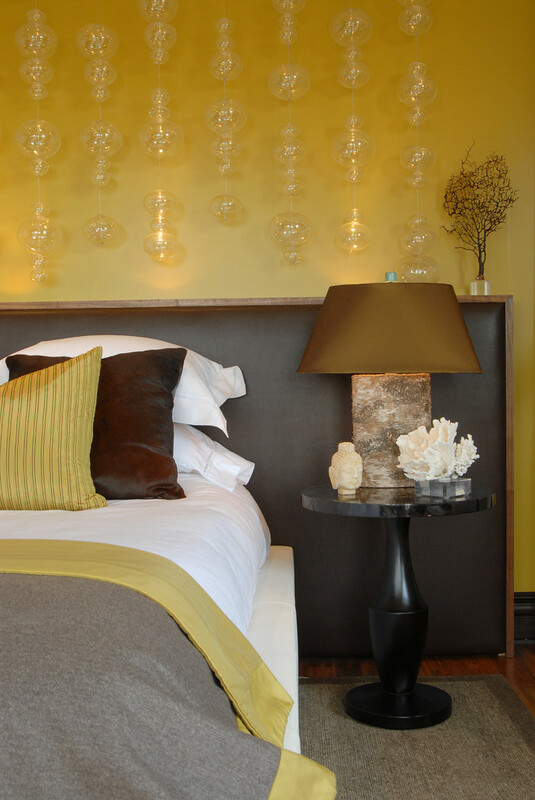 Gold bed linen also looks so great when being a complementary element of black bed frame. The real mustard bedroom idea. 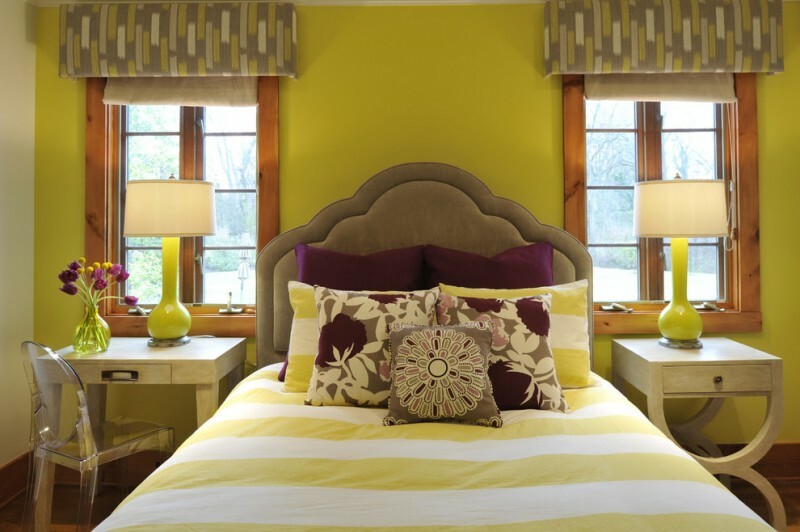 With darker yellow, white-colored window shutters and bed slipcover look much more stunning instead of other colors.